Full-waveform (FWF) airborne laser scanning (ALS) systems became available for operational data acquisition around the year 2004. These systems typically digitize the analogue backscattered echo of the emitted laser pulse with a high frequency. FWF digitization has the advantage of not limiting the number of echoes that are recorded for each individual emitted laser pulse. Studies utilizing FWF data have shown that more echoes are provided from reflections in the vegetation in comparison to discrete echo systems. To obtain geophysical metrics based on ALS data that are independent of a mission’s flying height, acquisition time or sensor characteristics, the FWF amplitude values can be calibrated, which is an important requirement before using them in further classification tasks. Beyond that, waveform digitization provides an additional observable which can be exploited in forestry, namely the width of the backscattered pulse (i.e. echo width). 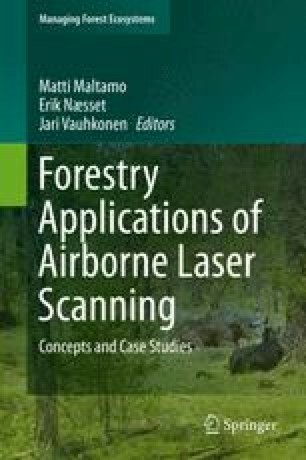 An early application of FWF ALS was to improve ground and shrub echo identification below the forest canopy for the improvement of terrain modelling, which can be achieved using the discriminative capability of the amplitude and echo width in classification algorithms. Further studies indicate that accuracies can be increased for classification (e.g. species) and biophysical parameter extraction (e.g. diameter at breast height) for single-tree- and area-based methods by exploiting the FWF observables amplitude and echo width. Markus Hollaus has been supported by the project NEWFOR, financed by the European Territorial Cooperation “Alpine Space”. Andreas Roncat has been supported by a Karl Neumaier PhD scholarship. The Ludwig Boltzmann Institute for Archaeological Prospection and Virtual Archaeology is based on an international cooperation of the Ludwig Boltzmann Gesellschaft (Austria), the University of Vienna (Austria), the Vienna University of Technology (Austria), the Austrian Central Institute for Meteorology and Geodynamics, the office of the provincial government of Lower Austria, Airborne Technologies GmbH (Austria), RGZM (Roman-Germanic Central Museum Mainz, Germany), RA (Swedish National Heritage Board), VISTA (Visual and Spatial Technology Centre, University of Birmingham, UK) and NIKU (Norwegian Institute for Cultural Heritage Research).